The microphone here is extra sensitive and can even pick up birdcalls from afar. The batteries actually last much less than 6 months. This dustproof and waterproof model is great for both tracking game and spotting animals that might be interesting to you. It has great recording quality in terms of both video and audio and offers an easy way out for hunters at a reasonable price. The BestoU company has courteously included a high-speed 32 Gb SD card with every camera, which will be enough to record several hours of video in the best resolution. 46 LED lights eat up a good chunk of battery life. The 0.25 trigger speed on this model ensures that you won't miss a single important event. 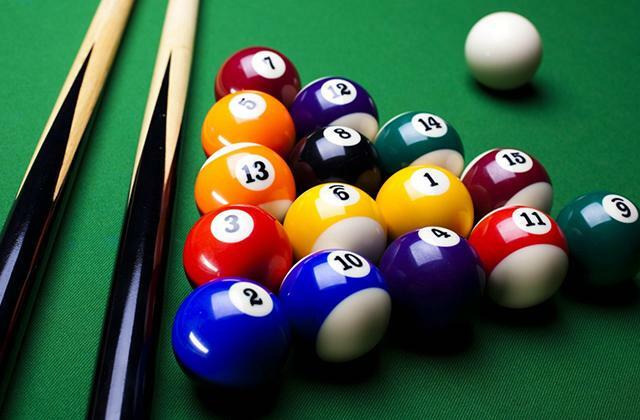 Moreover, you'll be able to see it in incredible detail thanks to the 16 MP resolution. The complementary SD card means that you can start taking photos and videos as soon as you get your device, no need for additional purchases. The photos and videos taken with this device will take up as little space as possible thanks to the new format. As a result, you will be able to fit much more material into the camera's memory. The polyester lashing strap gets worn out quite fast. 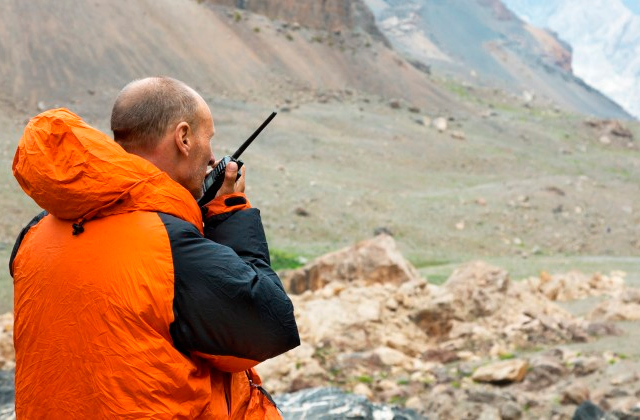 Are you into hunting and need to determine the wildlife's location quickly and covertly? Then choose the APEMAN H45 and enjoy the great trigger speed and high-resolution photos that take up little space with no loss of quality. The unique wall- or tree-mount allows fixing the camera in the desired spot in record time. 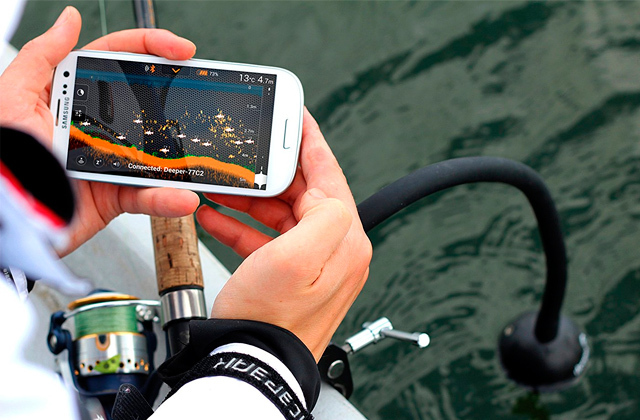 You will save precious minutes and make hunting with this device as efficient as possible. Some users note that the actual movement detection angle is below 90 degrees. The X-Lounger camera has many adjustable options so you can set up photo and video modes according to your own preferences. However, numerous menus are not difficult to navigate and even an inexperienced hunter won't find it compelling to use this camera. The 42 built-in LED lamps emit a special type of light that's invisible to the human eye so nobody else will spot your cam. 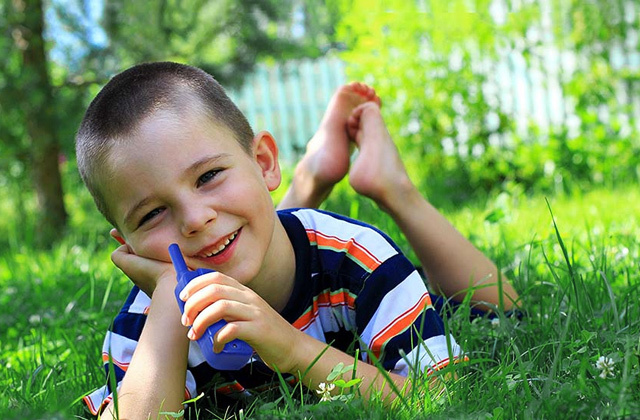 The microphone has low sensitivity which results in very quiet sound. If "affordable" is the key descriptor for you, then the Crenova RD1000 is a wonderful option. 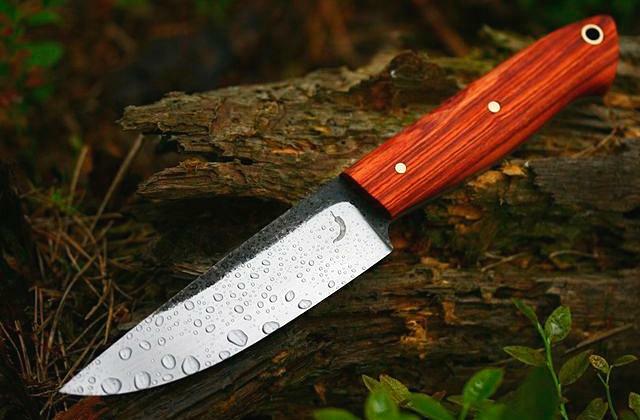 It's certainly one of the more budget-friendly out there and yet it delivers quality equal to high-end competitors. Though some tech specs are below the ideal level, this is a well-rounded camera with an appealing price tag. If you live near to the woods, you might be kept up at night by some forest critters roaming in your backyard. 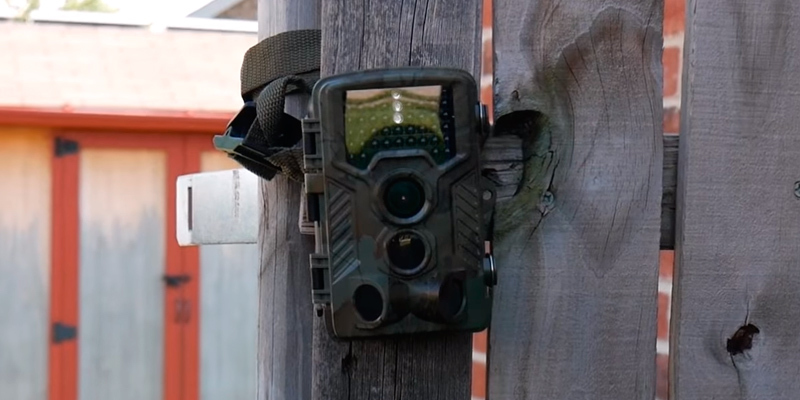 Those who’d like to find out whether it’s the neighbour’s dog plodding around or a couple of badgers getting in your flower beds can use a garden wildlife camera. For that purpose, we recommend the Victure HC200 IP66 Wildlife, which will help you track activity around your home and much more. This model is equipped with a motion sensor that will get start capturing video as soon as any critter comes close to the device. And, since most of the time you’d use the camera trap at night, it’s also equipped with a night vision feature. Don’t worry about the animals scattering too fast and leaving the footage useless either as the quality here is 1080P HD. Even something as fast as a deer will be spotted clearly on the Victure camera. Of course, video quality isn’t the only parameter that matters when it comes to capturing animals on cam. This model also boasts a 0.5 sec shutter speed, which isn’t the fastest on the market but certainly up there. The one thing that’s genuinely below what we expected is the viewing angle of 100 degrees. There are quite a few models that boast a higher spec and we certainly expect the most out of a cam that’s this good in all other aspects. And though we’ve been praising the Victure HC200 IP66 as a motion tracking device first and foremost, it’s also a great game cam. Not only can it withstand the harsh forest conditions thanks to a dust- and moisture-resistant body, the ultra-sensitive microphone here picks up sound at huge distances. Plus, it’s sensitive enough to discern something as quiet as a bird call heard many metres away over the sounds of rain or strong wind. We’d also like to point out that the coverage of the camera itself is up to 20 metres so even if you place it in a suboptimal position, it might still net you a peek of the animal passing by. Just make sure you have a working set of batteries in the device. Speaking of which, although the manufacturer claims that a set of AA batteries should last for half a year, it actually only gets you about 4 or 5 months at most. 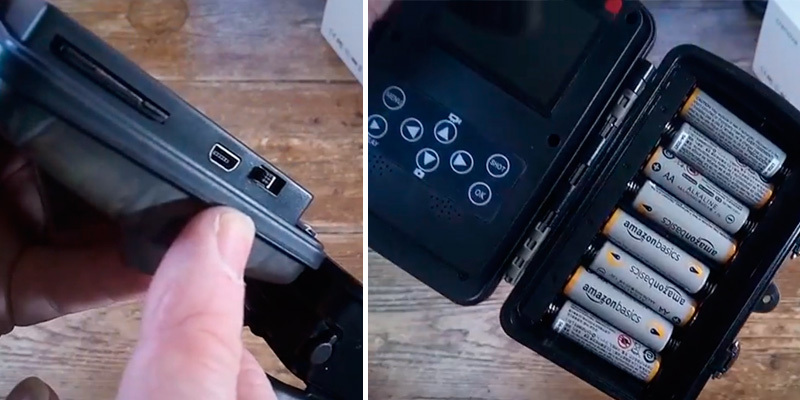 We definitely recommend having a backup set handy as you go to check out your hunting camera. 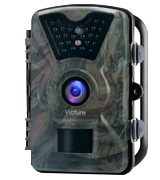 All things considered, the Victure HC200 IP66 is great for homeowners looking to keep their backyard critter-free, hunters that want to spot the game from afar, and aspiring ornithologists that want to keep track of local birds. Its technical specs are pretty great, the build quality is impeccable, and the overall result is a camera worth its money. 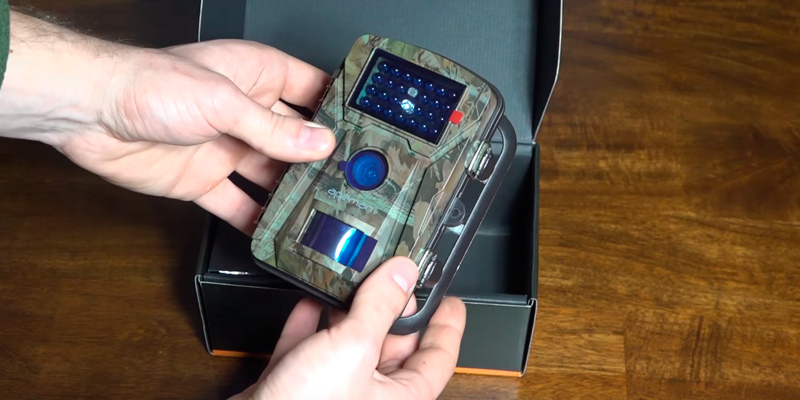 If you're someone who hunts for top-shelf digital equipment, you can’t go wrong with the BestoU Trail Camera 16, a high-class camera that comes included with several pleasant bonus features. The BestoU company is bringing you one of the best cameras for wildlife photography aimed at experienced hunters. The device comes packed with a 32 GB SD card for your convenience, meaning you can set up the camera and start snapping pictures right away without having to purchase any additional accessories. Due to the 16 MP resolution, the camera will take superb quality pictures so that you can see what animals lurked around your property in high detail. And if you need a camera that can be used during nighttime, the BestoU Trail Camera 16 will fit you, too. Thanks to the whopping 46 LED lights, each shot will be well-lit and clear. Compared to many other models offered on the market, this is probably the biggest number of LEDs you can find on a trail camera. Do note, though, that if you do not need to take photos at night, it's best to turn them off as they will eat batteries much quicker. The camera doesn't use flash which means it won't attract the attention of animals that pass by the camera during nighttime. 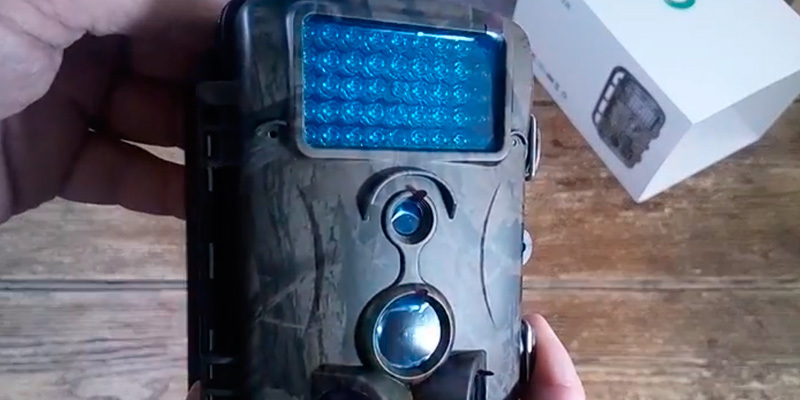 And it's very unlikely that this camera will attract the attention of other hunters during daytime as well, since it has a very discreet design. All of this makes the BestoU Trail Camera 16 one of the best cameras for night time wildlife photography. 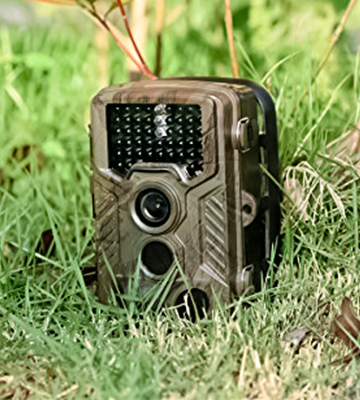 The BestoU Trail Camera 16 boasts a staggeringly low trigger speed of only 0.25 seconds that is half the speed of what most competitors offer, and allows for shooting even the fastest animals passing by the camera at full speed. You will be pleased with the quality of pictures since the camera takes very crisp photos without distortion allowing you to see everything in detail. 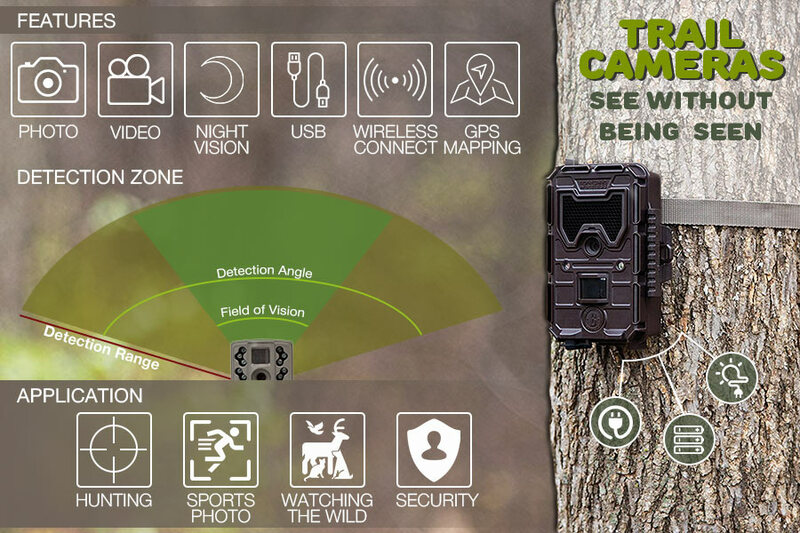 Furthermore, the BestoU Trail Camera 16 brags an impressive 130-degree viewing angle which makes it possible to spot game in all directions. And because what we've got on hands is primarily a wildlife night camera, the pictures will look clear and crisp even if they're taken during the nighttime. 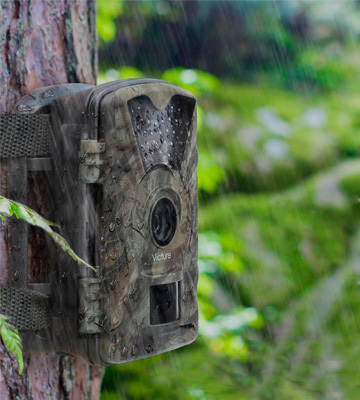 Overall if you're looking for a camera that you could use in all conditions and use for a variety of purposes not only in the woods but also in your garden, the BestoU Trail Camera 16 is the kind of wildlife camera you can totally rely upon. Thanks to its low triggering speed, wide viewing angle, and quality of photos you will always know what's lurking in the area you guard. 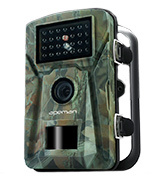 If you want a good camera that won't cost you an arm and a leg, consider purchasing the Apeman H45 - a camera that can meet basic needs of any wildlife enthusiast or hunter. The Apeman H45 will let you survey animals within the area of up to 20 metres snapping 3 pictures in quick succession, and provide you with an option to set up which data you'd like to be displayed on shots - temperature, time of the day, pressure, moon phases etc. This information will prove useful not only for hunters in need of trapping the game but also for those observing roaming species in the open. The footage can be stored on an SD card that you can purchase additionally. And although the Apeman H45 doesn't take as flawless pictures as some more advanced models do, they are still good and clear to make out most of the details no matter what time of a day the pictures were taken. Plus, they don't take up as much memory allowing you to store twice more footage. Given the price tag, it's quite natural that certain things about this cam could have been improved, and one of them is certainly its strap that looks quite weak and flimsy. When you do so, you'll have no reason to worry leaving it in the open unattended. In general, though, we believe that the Apeman H45 is best suited for use as a surveillance device in your own home or yard. If you suspect that some animals lurk in your garden or some unwanted visitors intrude in your property, the camera will allow you to find that out for sure. Despite the fact that the Apeman H45 shouldn't be regarded as a substitution for a proper security camera, it will nevertheless be a helpful device for many regular users that look to buy some equipment to snap pictures of what's happening in their yard. If you need a versatile camera with many flexible options and modes, you should consider the X-Lounger 611517144851. With so many settings and menus, it is a perfect choice for those that want a highly customisable experience. Dissimilar to most tree cameras that feature almost fully automated operation, the camera in questions gives the user an option to choose which settings are best suited for this or that environmental conditions. All settings are simple to use and menus are easy to find and navigate. Even if you have no prior experience of using a similar type of device, you shouldn't face any issues. In our opinion, this is one of the biggest advantages of the X-Lounger 611517144851 over many other models even with higher price tags as it allows users to add just as many additional tweaks to their photos as they like. 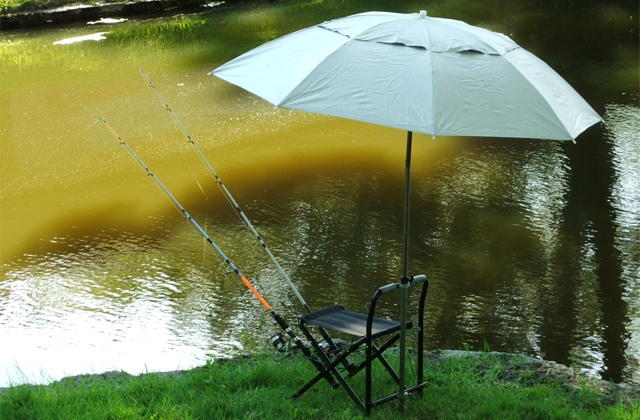 In addition to the option to customise settings, the X-Lounger 611517144851 allows for several mounting options enabling users to attach it to a wall, tree, or any other elevated spot in the open. 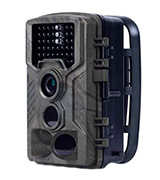 Like any other trail cameras out there, this one can also be used as part of your home security system if you do not see the point of buying a hidden camera additionally. However, don’t think that the X-Lounger 611517144851 is absolutely perfect as it does have some cons to its amazing pros. First off, its detector is not the strongest one compared to other cameras on this review and has only 90 degrees of viewing angle making it not suitable for shooting wide ranges. However, do not let this single aspect turn you off this camera just yet because despite its rather narrow viewing angles, the quality of pictures is quite on a par with some of the more expensive models of wildlife cameras available out there. Though the shot won't contain a full view of the scene, the details will be perfect thanks to the fact that this camera enjoys a very good optics. It will also be good for taking photos during nighttime owing to 24 infrared lights installed on it. Summing up all the said above, we'd definitely recommend the X-Lounger 611517144851 to all those consumers that have come in the market looking for an affordable trail camera that would allow them to customise the settings and show off pictures of a good quality. 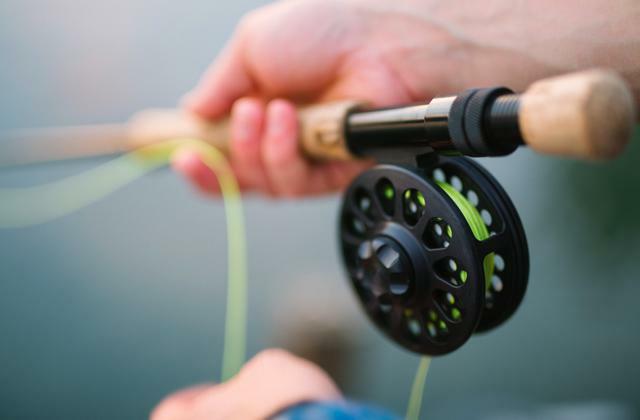 Whether you search for a camera to use on a hunt or you'd like to equip your backyard with some kind of a surveillance equipment that won't lighten your wallet, choose this one and you won't get disappointed. 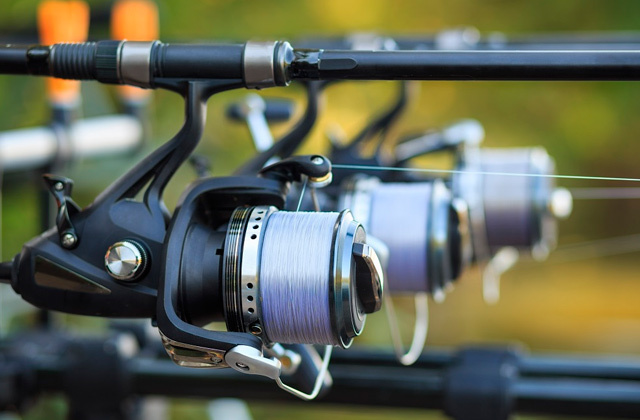 Looking to up your hunting game but don’t want to spend too much on the equipment, especially since there’s always the risk of it being damaged or even snatched by unscrupulous people? 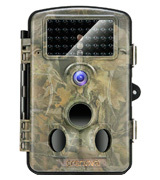 If you said yes, the Crenova RD1000 Trail Camera is the perfect choice for you and here’s why. Not only is this one of the more affordable models on the market, the Crenova RD1000 comes with a built-in feature that might not have been intended as a security bonus but certainly works as one. You see, this cam has 42 built-in infrared lights. That’s not just a higher number than you’d get in most other models, though, as the lights here use a special kind of light that’s completely invisible to the human (and animal!) eye. This means that the camera won’t be spotted by anyone other than you, especially if masked properly, and won’t spook off your game. And that’s not all the advantages of this camera in terms of tech specs as, for one, the Crenova RD1000 has a 120-degree viewing angle, higher than you’d see in some expensive models. 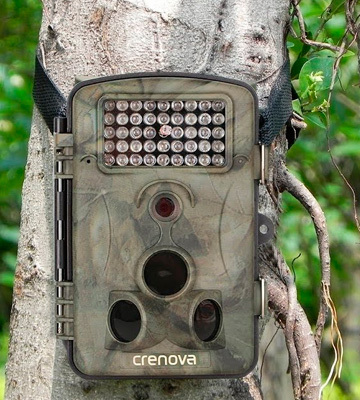 Couple that with 12 MP resolution and 20-metre recording range and you can be sure that no animals pass by the motion-detecting Crenova RD1000 Trail Camera unnoticed. 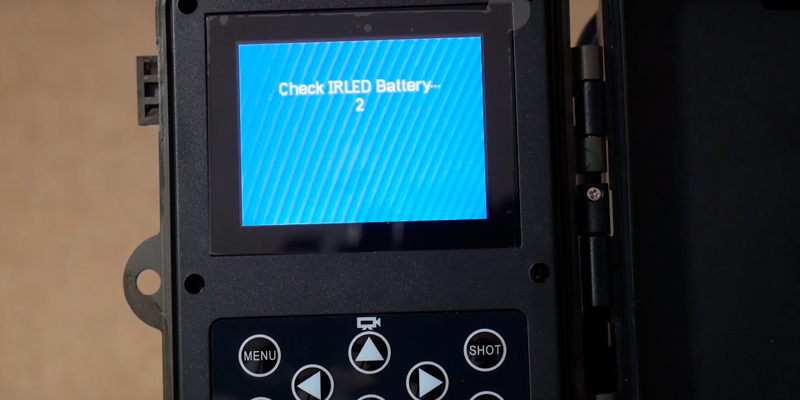 If you’re indeed purchasing the Crenova RD1000 because you want to spend your budget wisely, you’ll also be happy to hear that a single set of batteries here is enough for half a year of continuous use. That’s a pretty good stat, especially considering the higher than average lights number and overall tech specs. 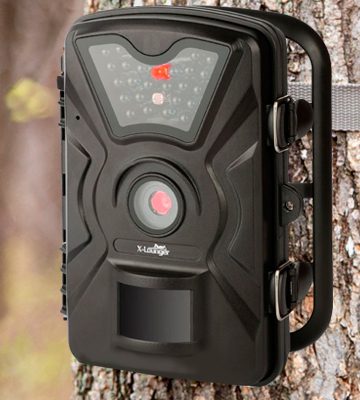 We do have to admit that not everything about the Crenova RD1000 Trail Camera is amazing. For one, we’re disappointed by the microphone on this one as it’s not the most high-sensitivity model, which can be important for a game cam. When you play back the recordings made on this camera, you might have to turn the volume up high if you want to really hear what was going on in the forest. Speaking of recordings, you can put a 32 GB SD card into the camera, which will allow for many hours of footage. Just make sure to seal the card slot well, you don’t want any morning dew to end up seeping inside the body of the device. 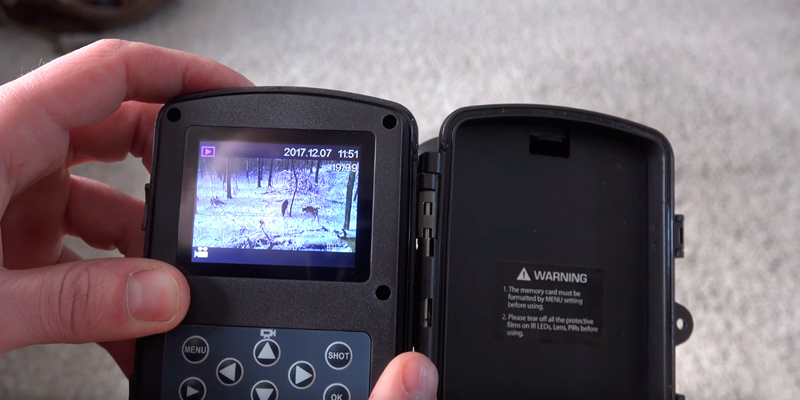 Despite a few shortcomings here and there, we can safely say that the Crenova RD1000 Trail Camera is one of the best budget-friendly choices of hunting equipment out there. It has good tech specs, an outstanding lighting system, and won’t be spotted by animals or would-be thieves. If money is tight but you want your hunt to go well, the Crenova RD1000 is a no-brainer pick. What Is a Wildlife Camera? A trail camera (or a wildlife camera how it is also called) is a type of a remote camera used mainly by hunters for taking pictures or video in areas with limited access, at different angles or where a man possibly cannot be. 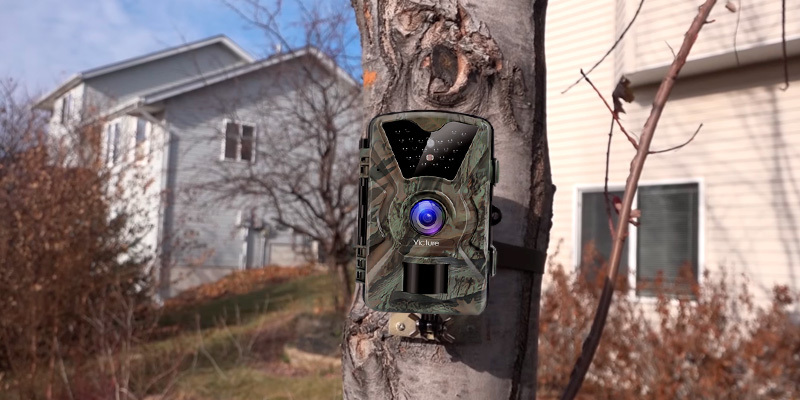 A hunter can hang a trail camera on a tree to be able to surveille wild aminals from a remote location in the wildlife and configure it to send notifications via camera software automatically when a motion is detected. 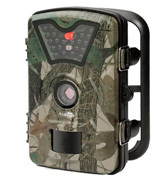 Trail cameras are usually enclosed in camouflage security boxes so that they could be seen neither by animal nor other hunters. Trail cameras aren't limited to use for hunting only and can be successfully employed for many other purposes too. 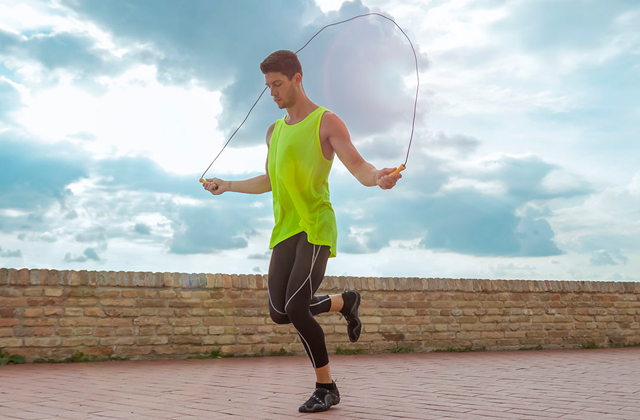 Today remote cameras are widely used in sports photography, for selfies, and in the wildlife. Setting off for a game hunting, you shouldn’t neglect wearing a protection outfit. With this in view, we’d recommend you to add shooting glasses to your camouflage outwear that would not only protect your eyes from dust and small particles but also sharpen your visual acuity in dim lighting conditions. Since a trail camera is first and foremost a camera, the first thing to consider when purchasing one doesn't necessarily differ from your regular photographic equipment. Naturally, we're talking about the number of megapixels that the camera boasts and the resolution that the aforementioned megapixels allow the camera to support. As it is with any other camera, there's virtually no downside to having more megapixels and a higher resolution since these specifications will allow you to receive clearer images. However, try not to go overboard since a higher resolution also means that the video and images are going to take more space on the camera's internal memory or SD card and you don't really need twenty megapixels to capture your game. The second thing to pay attention to when choosing a trail camera would have to be camera's night vision capabilities. 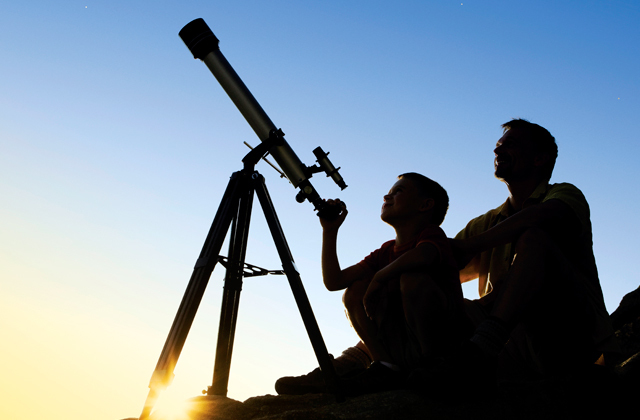 Since a large part of the surveillance process generally tends to happen during the night, you need to make sure that the night vision technologies that your device boasts, be it infrared illuminations system or LED lights, is enough to have a clear picture long after the sun set down. You also absolutely should not disregard the kind of battery life that the model you're looking for is capable of outputting. Since trail cameras are often left in the wilderness for a long time, the kind of device that isn't capable of lasting for days without undergoing a battery change will be a liability at best and a useless piece of overpriced technology at worst. The last but not least thing to look out for when choosing a proper trail camera is the kind of trigger speed it is equipped with. Unless the name isn't self-explanatory enough, trigger speed is the amount of time it takes for your device to capture an image. Since the majority of your game tends to move around rather fast, your camera will prove inefficient at taking a picture of it if the device doesn't boast a fast trigger speed. A majority of inexperienced users when browsing any photography-related products will likely look at the number of megapixels in the camera and exclaim that the device must be great if there are so many of those mysterious megapixels crammed into it. However, that is far from being true and megapixels are not the defining parameter you should look out for. Most of the cameras have their megapixel ratings interpolated. What this means is that a device’s actual megapixel rating is boosted by a certain software. And while this theoretically allows achieving a higher level of resolution most customers search for, it doesn't, alas, bring the kind of quality that is associated with it. Which is why one of the best and trusted ways of learning the type of quality you can expect from photos is, well, by looking at these photos. Compare pictures taken with two devices that have different megapixel ratings, do the results seem that starkly different? If yes, choose the better one. If not, then ask yourself why you should pay more for a phantom metric. Most high-quality wildlife monitoring cameras come equipped with rather powerful flashes. There is surprisingly little research into how they affect animals, though. Anecdotal evidence suggests that some species can be scared away by a sudden white light, while other animals remain undisturbed even if the flash goes off right in their face. Some scientists have looked into whether a bright enough flash could actually harm some species with more delicate eyes, but shockingly little is known about animals’ reactions to the phenomenon that should be very unusual to them. The majority of experienced hunters suggest that bucks are more prone to being scared of flashes due to their inherent unpredictability and twitchiness, while smaller creatures could actually be attracted to a strange object, which could lead to them damaging the camera. All in all, it is best to choose which animal you’re going to photograph and look into each of the species on a case-by-case basis. Time-delay is a little option that you should encounter in any outdoor motion sensor camera for wildlife that is worth its money. With this, you choose how often the device should snap pictures when an animal is detected. If you’re hunting for a deer, you’ll likely want to set the time-delay quite low, because the animal might just run past the camera and you’ll have a very small frame to take a photo. However, if you’re dealing with some of the slower, less cautious beasts, you can even hike that time-delay up to 60+ seconds. For example, if you set your camera up next to a feeder and some birds come to eat there, you need to have a high delay or you’ll end up with a hundred photos of a lonely creature pecking at whatever bait you’ve left behind. That is counterproductive and will obviously just waste your time when you could be capturing a bigger and more important game. Choose the appropriate time-delay and save yourself a headache of deleting unnecessary pictures. Q: I have heard about game cameras. Is there a difference between a game camera and a trail camera? A: No, these are just two different names for the same type of product that people use interchangeably. These types of cameras are essentially created with the sole purpose of assisting you in capturing the target’s picture and location; which can often present quite a challenge when it comes to determining it in the wilderness. The vast majority of this models generally have a detection field somewhere around 50 feet or higher. After you're done installing it and the whole thing is set up, these devices are capable of sensing movement and will activate the trigger in order to collect useful data for hunting without your presence or involvement. 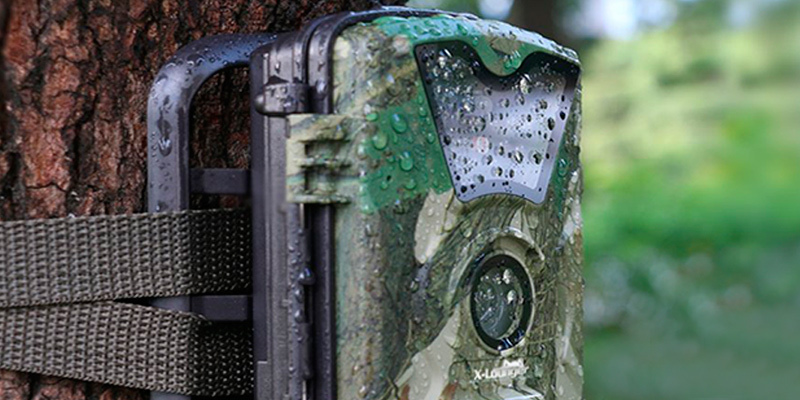 Q: What things should I keep in mind when it comes to a trail camera? A: There quite a lot of different things and aspects that you should keep in mind and consider before and after buying a trail camera. The majority of modern trail cameras are capable of supporting night shots. An LED mounted camera can take color pictures in the night but the problem is that their bright white flash can often scare away the animal, not to mention the fact that it can also blind you for a few seconds for a good measure. If one of the most important things to you is the ability to avoid attracting any kind of attention, you should consider a model with Infrared invisible flash. Of course, these types of models have their drawbacks too and IR flash will only support black and white pictures in the night. Just like with any other camera, the clarity of the image will mostly depend on the highest possible resolution the camera is capable of delivering but contrary to the majority of regular cameras, the resolution does not make that big of a difference if you're looking to capture images during the night. Q: What is trigger time? A: Trigger time is the time that a camera requires in order to capture the image. This is the most important feature of a trail camera if you have to capture a moving target, which is unlikely to provide you with more than a fraction of seconds. The fastest known trigger speed found in trail cameras is somewhere around 0.14 seconds but anything below an entire second can be acceptable depending on your situation and requirements. The problem with a slow trigger speed is that it will inevitably spoil the picture unless you're trying to capture a target that is standing still. Some models come equipped with multiple shot options, which enable more than 1 picture to be taken at a time. This kind of structure guarantees that at least one of the pictures taken will present an acceptable level of quality. Q: Is the image quality the same during the night? A: No, there's a noticeable difference between the day and night shots. 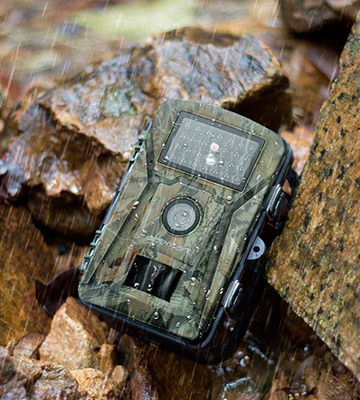 That difference will entirely depend upon the functionality and features of the trail camera. The incandescent or LED mounted cameras are capable of taking clearer and colored pictures during the night which is an option that infrared cameras are lacking. But when compared to the day pictures taken by an IR or incandescent camera, the latter one delivers a considerably inferior level of clarity and the colors are far less vivid. 1. Derrek Sigler A Trail Camera Buyer’s Guide, OUTDOORHUB. October 10, 2013. 2. Mitch Strobl Here’s the Easy Way to Pick the Perfect Game Camera, BassProShops. October 5, 2014. 3. Pet Lefemine 10 Trail Camera Tips, Bowsite.com. 4. Trail Camera Tips and Tactics For Deer Season, Muddy Outdoors. 5. 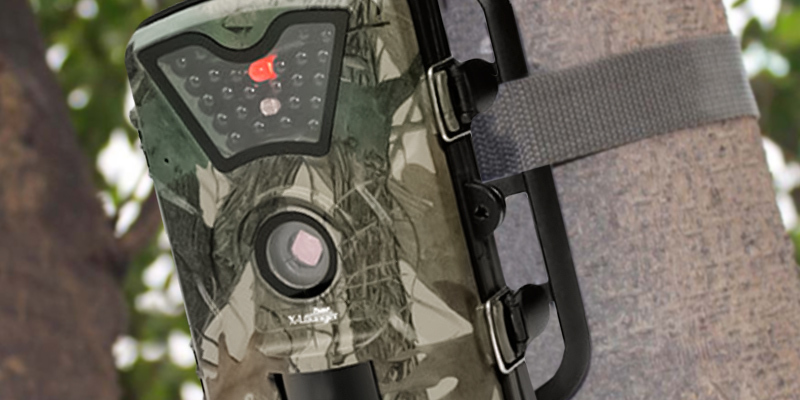 See Without Being Seen: A Primer on Trail Cameras, B&H Explora. 6. How to Run a Trail-Camera Survey, QDMA. 7. How To Set Up A Trail Camera | Trail Camera Tips, The Buck Advisors. 8. Hunting and shooting in the United Kingdom, Wikipedia. 9. Hunting and shooting wildlife, GOV.UK.